Aside from having Italian heritage, I also have some Irish heritage. My diet is mostly Italian (pasta, pasta, and more pasta), but when it comes to alcohol I have Irish preferences. Bailey’s anyone? When I spotted this recipes for Irish Carbomb cupcakes at Smitten Kitchen, I was sold with the words “chocolate” and “whiskey”. I could go on and on about the rich chocolaty flavor of the cupcakes and the icing that makes me swoon, but I’ll just say this: these cupcakes are my favorite cupcakes EVER. I’ve eaten many cupcakes in my life, but these would be the cupcakes I would request for my final meal on earth. The entire final meal, not just the dessert part. 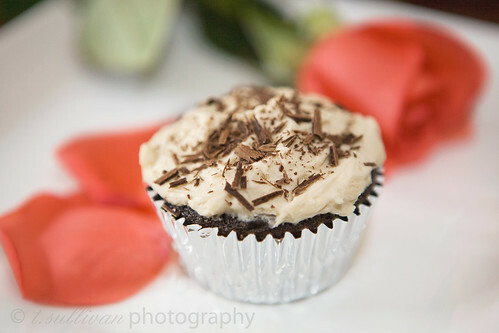 You maybe be wondering about the rose petals in the photo, and while I confess that I do love chocolate and Bailey’s (especially together), the real reason is that I made these cupcakes for Valentine’s Day. Valentine’s Day is long gone now, but St. Patrick’s day is coming up fast and these delicious cupcakes made with both Guinness and Bailey’s are the perfect way to celebrate the Irish in all of us. Note: While the Guinness will mostly bake out of the cupcakes, the frosting has full proof Bailey’s Irish Cream in it, which is to say that if you or the lucky recipients of these cupcakes don’t drink, these are not the cupcakes for you. Do ahead: You can bake the cupcakes a week or two in advance and store them, well wrapped, in the freezer. You can also fill them before you freeze them. They also keep filled — or filled and frosted — in the fridge for a day. (Longer, they will start to get stale.) They store very well, even frosted, in the freezer if for some reason you don’t want to eat them all at once.